Directions: Add BHT crystals to cooking oils or salad dressings to retain their freshness. Add 1/4 teaspoon (600 mg) of BHT to 1 gallon (approx. 4 liters) of cooking oil (as per food guidelines). Shake well. The crystals require several hours to dissolve. BHT... It used to safeguard our food supply; now it can safeguard you. BHT, a distant relative of vitamin E, is an antioxidant that was once widely used to protect food from damage by oxidation and microorganisms. It is now frequently used to combat the aging process. BHT’s usefulness as a supplement is due to two unrelated characteristics: its antioxidant properties, and its effects on biological membranes. 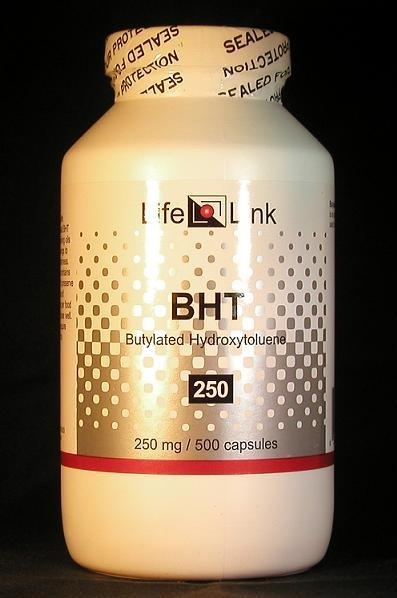 BHT’s antioxidant properties are responsible for its activity against aging, cancer, cardiovascular disease, and brain damage; its membrane effects are responsible for its anti-viral benefits. Accordingly, we will limit our discussion of BHT to a brief summary of relevant research, and let you draw your own conclusions about what medical conditions it may be effective in treating. In the United States, BHT is approved by the Food and Drug Administration (FDA) as a food additive but is not considered a “nutritional supplement” because it is produced non-biologically. The FDA therefore prohibits its sale as a supplement. Nevertheless, its medical uses are documented in the medical literature and will be described here, even though LifeLink is required to pretend that this product is being sold merely to prevent the spoilage of food. How does BHT work in the body? BHT’s medical usefulness is due to two unrelated characteristics: its antioxidant properties, and its effects on biological membranes. BHT’s antioxidant properties are responsible for its benefits vis-à-vis aging, cancer, cardiovascular disease, and brain damage; its membrane effects are responsible for its anti-viral benefits. In BHT’s other function, as a membrane manipulator, molecules of BHT merge with the lipid membranes of cells and of viruses that have lipid envelopes (such as the herpes virus). The presence of enough BHT molecules in a viral envelope can alter the envelope’s physical properties enough to make the viral particle incapable of infecting a human cell. This can bring a halt to a viral infection’s spread within the body. What is BHT good for? To put it briefly, BHT has been shown to lower the incidence of herpes outbreaks, and to shorten the duration of those outbreaks that do occur.15,4,16 It appears to work better in some people than in others — perhaps because the susceptibility of human cells to membrane-altered viruses varies from person to person. For some people BHT may be an excellent preventative; for others it may ineffective. There’s no way to predict in advance whether it will work for you — you simply have to try it to find out. While people’s genetic susceptibility to herpes viruses probably varies between individuals, the herpes virus’s susceptibility to interference by BHT probably does not vary from strain to strain. While viruses can develop resistance to antibiotics, which act upon specific viral protein structures that are determined by specific viral genes, viruses are highly unlikely to develop resistance to a substance like BHT, which alters membrane properties that are not determined by viral genes. During the 1970s and 1980s, neurotic food-activists scared the public into thinking that BHT and other food preservatives were highly carcinogenic. They succeeded in getting preservatives removed from most food products — and as a result, thousands of cases of food poisoning, some of them fatal, now occur every year that would otherwise have been avoided. Those preservatives were protection against the production of toxic chemicals in food by microoganisms. But at realistic doses BHT is not carcinogenic — in fact, it is anti-carcinogenic.17,8 Our society has paid dearly in both money and health for caving in to the irrational demands of those food-activists. At high doses, on the other hand, many substances, both synthetic and naturally-occurring, are carcinogenic — they can initiate or promote the growth of cancer cells. All plants, including those we use for food, produce many kinds of substances that cause cancer when fed at huge doses to lab animals.18,19 Cooking generates even more carcinogens in food.22,23 But so what? At lower doses many of them actually protect against cancer. We don’t consume these substances in carcinogenic amounts, and we don’t consume BHT in such amounts, either. Is BHT useful for the conditions and purposes mentioned above? We aren’t allowed to tell you, so you should take a look at some of the references cited here, and then decide for yourself.